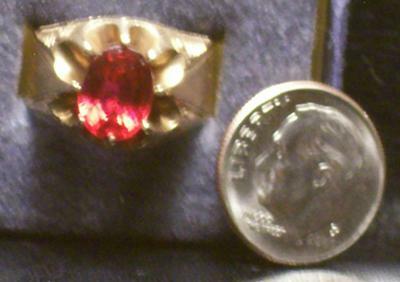 SOLID GOLD stamped French or Czech ruby or garnet ring? I inherited some jewelry from my father, he'd be about 79 now if he had lived. The ring was a gift from his Godmother when he was 16. She was French and came over from Europe. My father was Czech, his family came over from Bohemia. 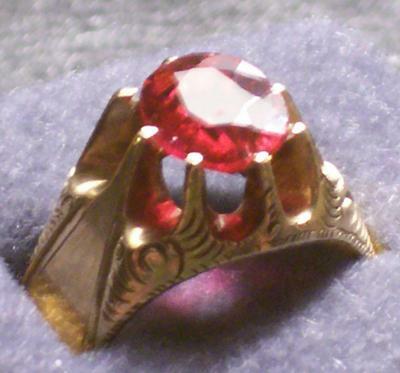 The ring is Edwardian style, stamped SOLID GOLD inside, but no other mark, has a large red stone, I was told its a ruby but I suppose it could be some kind of fancy garnet that I am not familiar with. Beautiful, bright color, clear stone. Stone does have a small chip where one of the prongs was. Unfortunately his brother cut the back of the ring to make it "adjustable" (aargh!) for his girlfriend (who later became my mother) and there appears to be some kind of silver-toned solder on the one side? Did the French (or Czechs) ever actually produce jewelry marked SOLID GOLD? Does that mean its 24K? Would a jeweler be able to remove the solder (or whatever that white metal is) and restore the ring and if so would that be very expensive? Do you know if the French were partial to rubies? She also gave him a pair of gold cufflinks & a stickpin in a LION head shape, I believe these are ART NOUVEAU style, these all have cabachon eyes & a faceted stone in the mouths, these I believe are garnets they have that deep red color. No KT weight but they are far nicer than any others I have ever seen on the internet, I believe they are real gold not plated or filled, very fine workmanship but without a marking how can I tell? Would a jeweler be able to match the color of stone to replace the one missing in the mouth? 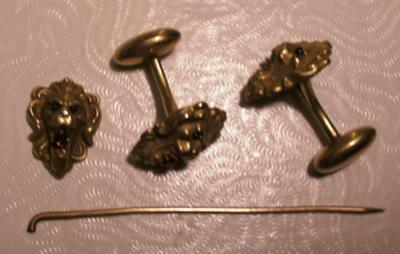 Also have 2 bar pins, I'm assuming were his mother's, are stamped "sterling bar" I think the 2-1/4" one is all diamonds and the other one is 3" with diamonds & pinkish stones, much lighter in person than in the photos, more pink. They look ART DECO to me, the pink stones are very finely faceted & matched, just lovely. Any idea what pink stones were used back then, if it were new I'd be tempted to think they were those lower quality light amethysts, but back then I'd think they'd be using the deeper purple ones... and did they really set diamonds into sterling back then? THANK YOU VERY MUCH I love your website, very informative ~ I have printed off tons!